Enjoy, relax and have fun in your leisure time. Fantasy is a special place that has a good atmosphere and well designed shops. You can leave the crowds and noise of shopping malls behind and have a quiet afternoon tea and stroll through the various shops in this interesting area. 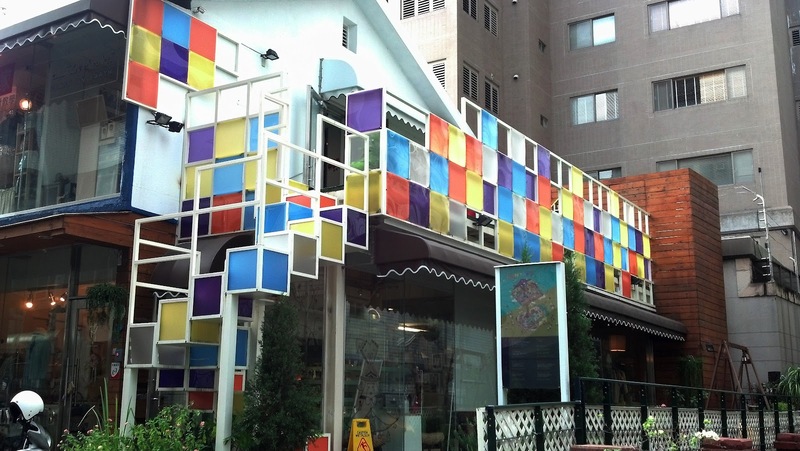 From outside on the street, you can see the walls of the main building are painted in colorful geometry. After you enter this small shopping “district,” you will see many well designed shops along the street. These are your first impressions of Fantasy. Fantasy is a small district of old buildings that have been renovated and made into shops. The idea of Fantasy is of providing a comfortable space for people who have great ideas and want to open their own small business. The founder of Fantasy had an unsuccessful experience running a business because he didn’t think that running a business cost a lot. For other people, too, “we can’t afford the cost” is one of the reasons why great ideas are not realized. Therefore, the founder established a space for people who share the dream of owning their own store. In Fantasy, the bills are shared among the small shops so that each shop’s cost could be reduced. This makes it easier for the shopkeepers to run their stores. Now, these shopkeepers’ dreams have become a reality. Fantasy is composed of a number of well designed, small modern shops. Fantasy provides a place for people who want to find some fun and enjoy a unique window shopping experience. Shoppers are allowed to browse freely through the shops. One of Fantasy’s features is that each shop has its own theme and their products are unusual and delicate. The atmosphere in each shop is different and gives you a unique shopping experience. To get to Fantasy, go to SOGO department store and go along Meicun Road. You will see H&B real estate(住商不動產) on your left-hand side at Lane 117. Turn left on Lane 117 and go straight; you will a colorful geometric wall. That is Fantasy. Fantasy is a place full of amazing and unusual products. We believe that you will have fun here.